Whispering Oaks Cottage: CHECK this out! Look at this kitchen! The floor "makes" this room look perfect! And look at this tiny bathroom....Isn't it so sweet? Perfect balance of patterns without going TOO overboard. And look at this mosaic I made using Flickr tools. (see side bar in my blog to access my Flickr account and see credits for photos.) Isn't it fun? OOOOO, boy, I do LOVE black and white checks. Did you see my new kitchen backsplash? 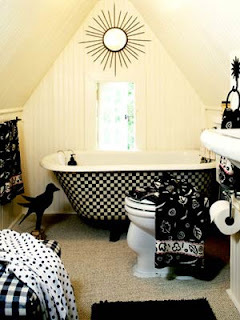 BLACK AND WHITE CHECKED TILE....and I love it to pieces! Can't wait to see all your changes. So so good to hear from you, sweet friend. 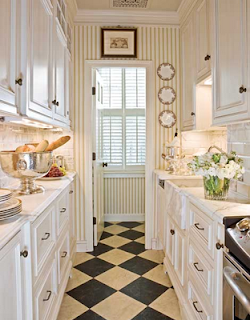 LOVE the black and cream colored floor...so chic! WOWZER! I love all that black and white going on! Great pictures. HEY YOU!!!! I was at BJ'S and saw the name HOLLY and thought...mmmmm?? I have tried sooo many times to get onto your blog and just couldn't...I am so happy I did this time, how are you? Hope all is well, and I will be back lots, take care, Chrissy aka "SEACLIFF"
You know what? I think I am about to redo my kitchen. I absolutely Love the black and cream floor! I can't stop looking at it. WOW! Wow! We once had a 1930s fireplace with black checks and, strangely, a few flowers - it worked! It was hard to leave the fireplaces in that house behind when we moved to France. It's been good to discover your blog and read the words from Scripture - you have really encouraged me tonight! great pictures, I love that bathroom! ok.. now show us what youve done! Oh how I love these! Black and white or cream is so classic and always looks so good! So inspiring! I love, love, love black and white, and any other color thrown in with it! The colors are so vibrant and cheery. That kitchen is ever so pretty! I could see me soaking in that tub reading some favorite magazines, too! I love black and white too..our whole farm house is done in black, cream and dark red accents. I was just out visiting new blogs and found yours. Enjoyed my visit! I love black and white to! Hey stranger... just wanted to say hello and i hope you are enjoying spring!! All the best my friend!! I just love the black decor. Your pics are awesome. Lots of inspiration here. Hope you are doing well. Missed seeing you. I love that kitchen floor too! So classic and never goes out of style! I love all the black and white checks!!! 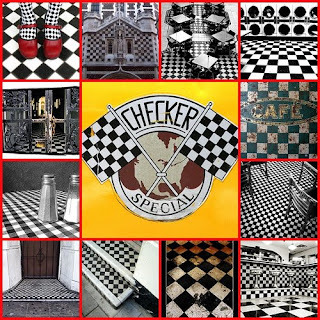 My favorite dishes have black and white checks all over them!!! I became a follower of yours today and look forward to many more visits!!! Have a wonderful Memorial Day weekend!!! Hugs and blessings my sweet lady..
Checks are the greatest. They just add cheeriness and punch to a room. Delish! I love black and white too...it's so graphic, isn't it? That is the best look for a bathtub I have ever seen. To me, the older tubs have an inside and outside ??? It seems your tub has both, if you catch my drift. The outside has taken that rougher look away and made it classy.